Those are used for the spring, because they are made from seal. You can see seal skin on the top, and ugruk here [bearded seal, used for the soles]. I guess that is from a coastal village; in reindeer country you mostly use reindeer to make boots. The seal skin protects from snow and wet. These boots are made of ringed seal fur, with ankle ties of bleached leather. Grass pads and fur insulation were used inside for warmth. Skins are easier to work with in cold weather, so women sewed most footwear during the fall and winter. 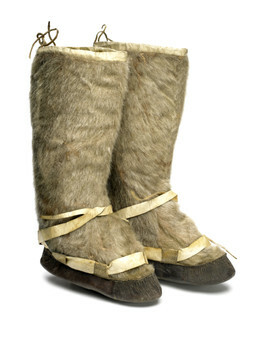 Aron Crowell: These are Chukchi boots and, 1949 [museum accession date] is the year we have. Nicolai Etteyne: Those are used for the spring, because they are made from seal. You can see seal on the top, and ugruk [bearded seal] inside, that is, I guess, from a coastal village. In reindeer’s [village], you mostly use reindeer. The seal protects from snow and wet. You can’t use it in cold weather. Aron Crowell: Oh, you use it when it’s warm. Aron Crowell: . . . Did your family do seal hunting or coastal hunting? Nicolai Etteyne: Yes we did that. We went all around, because the seal is important food for us, and also we use the fur to make pants, boots, gloves, sacks. And also from seal skin we make harnesses for dogs and ropes, very thin ropes. Aron Crowell: So people would wear that kind of garment, that kind of clothing, to go out onto the water? To go out hunting? Nicolai Etteyne: Mm-hmm, they would make [that clothing] from seal skin, because it’s better than reindeer. Because when you start to sweat in reindeer, it begins to get smaller. Nicolai Etteyne: Seal skin is easy to dry and easy to [rub together] . . .